The original idea for creating this applet comes from Steve Phelps﻿' Graph the Line applet. Directions: 1) Examine the equation shown on the right side of the screen. 2) Reposition the 2 big points so that the line is the graph of the displayed equation. 3) Click the "Check Answer" checkbox to check. If you're correct, the applet will inform you. If you're not, you'll know this as well. If you're not correct, keep trying until you position the gray line correctly. 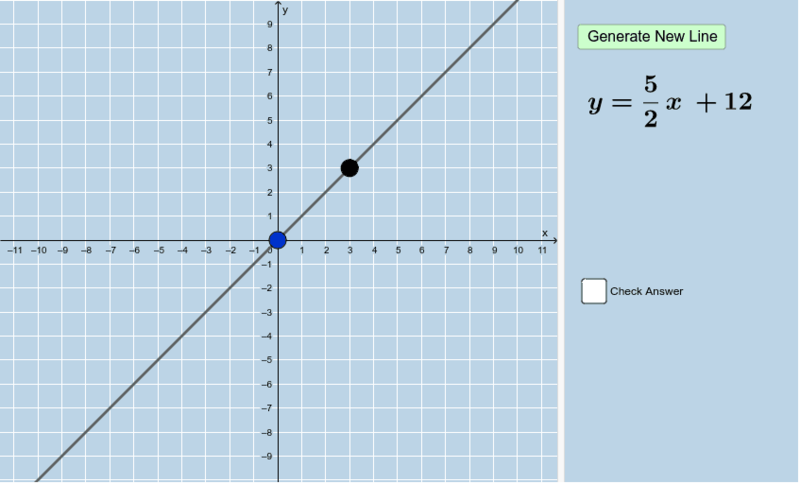 4) After correctly graphing the line, click the "Generate New Line" button. Repeat steps (1) - (4) as many times as you need until you've mastered this concept. If |u| = 10, |v| = 8, and the angle formed between them is .